Are You Sick of Sitting? Did you know that sitting is considered the new smoking? Pretty scary. Too much sitting has been linked to diabetes, heart disease, cancer and other serious health conditions. Sitting has even been shown to increase the chance of obesity. Plus, it also can strain the back. It seems nearly unavoidable to sit during at least part of the workday. So many of today’s professions involve being at a desk for extended periods of time, putting increased pressure on the discs in your back, decreasing muscle tone and causing spasms. It’s often difficult to remember to sit properly, and poor posture is all too common. With regular chiropractic appointments, you’ll find that sitting and standing are more comfortable because your body can function properly. Your posture may improve, and I am happy to provide recommendations about avoiding pain with stretches and activities you can do during the day. In addition to regular chiropractic checks, it might be a good idea to look into hybrid desks. These desks can be raised, allowing you to stand and work when you feel like you can’t sit anymore. 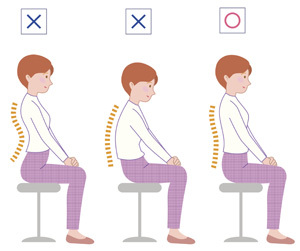 Switching positions decreases the pressure put on your back from long days at the computer or completing paperwork. Another great suggestion I tell patients about is to get up and move around every 30-45 minutes or do some stretching. Be proactive and do things like take the stairs instead of the elevator or walk to your colleague’s office to chat instead of calling them on the phone. The more you can be active, the less sitting or standing for long periods will bother you and affect your health.